When most people think of insulation, they think of insulation against the cold. However, if the area of a building is the roof, insulation against the heat in summer is also extremely important. To avoid unpleasant heat in areas directly under roofs, insulation materials with higher volumetric heat storage capacity and lower thermal conductivity are required. 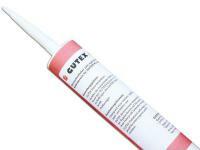 GUTEX insulation boards are specifically engineered to provide the optimum combination of these two properties. Besides the above-mentioned attributes, GUTEX insulation boards provide superior soundproofing, vapour permeability and moisture regulation. 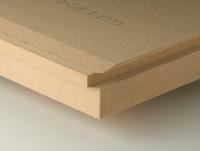 Moreover, the boards install in thicknesses up to 200mm in a single work step, saving time and money! For between rafter applications, it is important that the insulation boards have sufficient flexibility and resilience to enable them to bend, return to original form and join and fit tightly. GUTEX Thermoflex wood fibreboard meets all these criteria, performing superbly in framed and between rafter structures. The combined features of insulation against heat and cold, soundproofing, fire protection, vapour permeability and humidity control offered by this product provide a much higher level of living comfort. Roof decking should be water tight to protect buildings from the ingress of moisture in the event shingles or tiles are damaged by a storm. GUTEX Multiplex-top and GUTEX Ultratherm, both rain tight sub-plate boards, can withstand the elements for up to 10 weeks in an uncovered state. GUTEX roof decking boards also significantly increase the sound, heat and cold insulation performance of roof constructions. 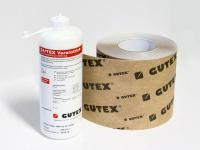 GUTEX Thermoflat is designed for use on all flat roofs and is virtually unlimited in its range of application. Roofing material can be installed directly over it and left exposed, covered with gravel or severe as roof terrace. GUTEX Thermoflat is equally suitable for new or old wood, metal or masonry substrates and offers buildings all the advantages of GUTEX insulation boards.